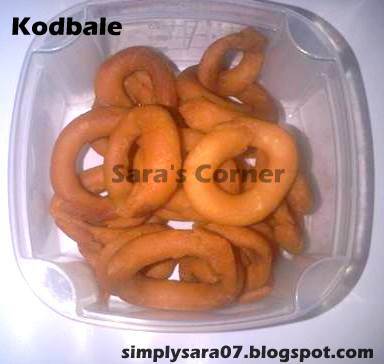 Kodbale is a crispy rice flour rings. Its favourite for kids and my son loved it. Checkout my another version of Kodbale here. 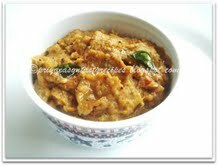 In a thick bottom Kadai, put rice flour, maida and fry it for sometime till it becomes warm in medium-low flame. Fry continuously. Transfer it to a bowl. Allow it to cool. 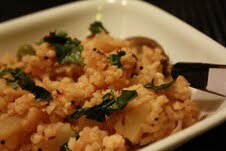 Add red chilli powder, salt, Sesame seeds and asafotida. Mix well. In a Kadai, add oil and heat for 2mins. Add hot oil to the flour. Sprinkle little water and make soft dough. 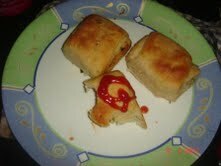 Heat oil in a kadai and drop these rolls and deep fry till brown in low flame on both sides. Another baking this week, it was my Dad's Birthday ydy and I really wanted to bake a perfect cake for him. My dad and uncle used to tell me to go to Baking Class, but I didnt go, now I really feel for it. If I had gone it would have been so useful for me now:-( But now since he is here in SG, I baked and they liked it a lot and was very happy to eat eggless cake after so many years as he dont eat cakes until eggless. So was browsing couple of recipes and found this one. I had pineapple juice and fruit at home and here is my recipe for Eggless Pineapple Cake. Melt butter in Microwave for 30 secs. 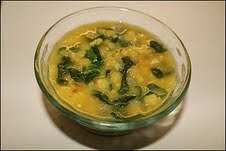 In a bowl, add melted butter,condensed milk. slowly mix it up in a spatulla. 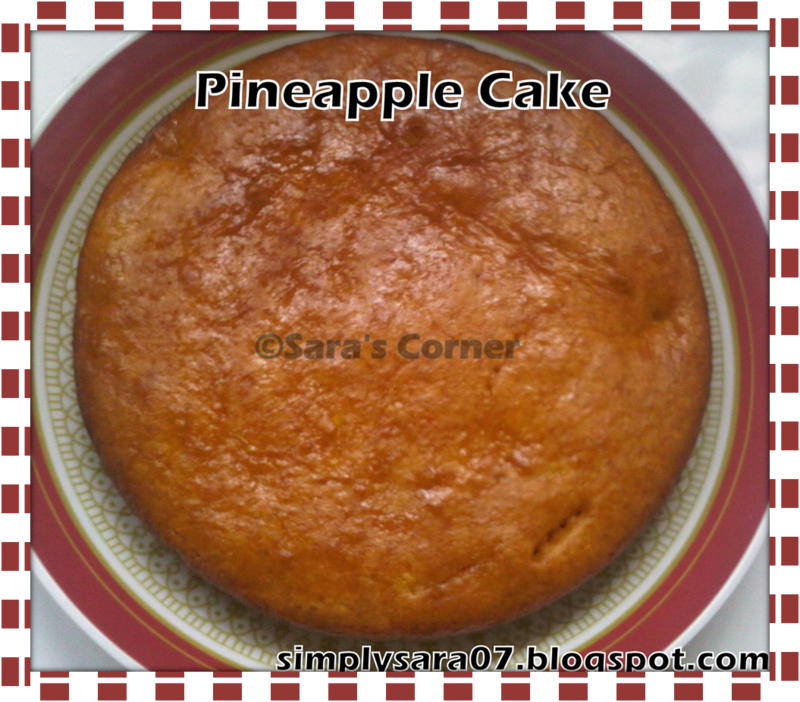 Add 2 tspns of pineapple pieces and little pineapple juice. Save little to brush on top later. Seive APF, baking soda, salt and baking powder. Add slowly in parts APF, baking soda and baking powder. Fold it or mix with spatulla. Grease the baking tray or pan.Bake it for 20mins or check with a fork or toothpick until it comes out clean or bake it for 5 mins more. Brush leftover pineapple juice on top when its slightly warm. When its cooled cut into desired shapes. Garnish with whip cream, few fresh pineapple pieces and cherry. 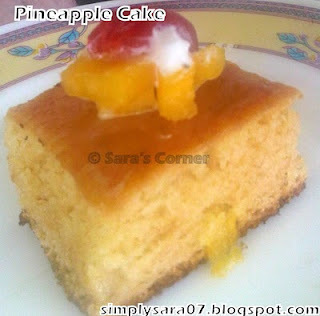 Enjoy this soft Eggless Pineapple Cake. Notes - You can also use tinned Pineapple and use the same juice. You can also use Pineapple essence. 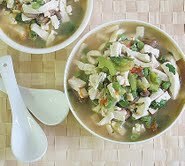 Keep leftover pieces in fridge and use later. 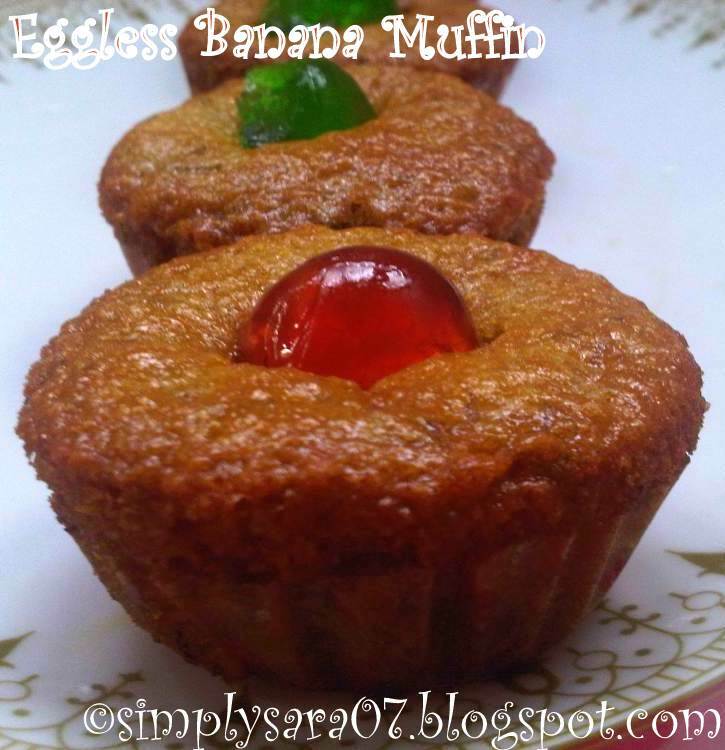 This recipe is going for Crazy for Cakes by Priya. 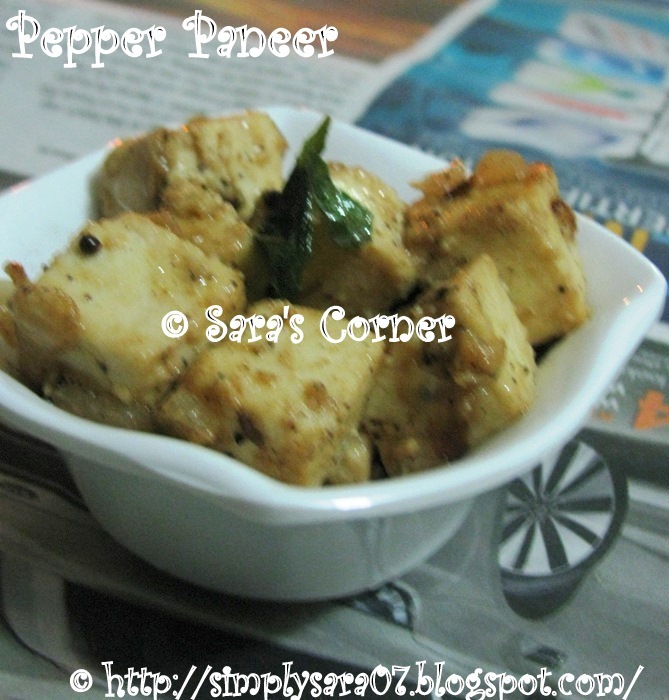 Idli is a popular breakfast/tiffin in South India. 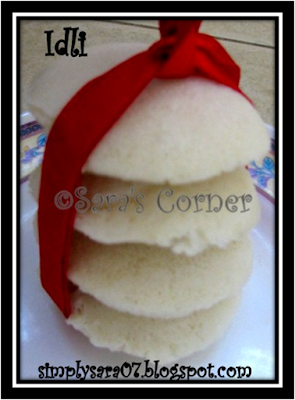 I know I am too late in posting this, I thought I had already posted this plain idli. But I have posted previously Masala Idli, Thalicha Idli, Chillied Idli and Rava Idli. 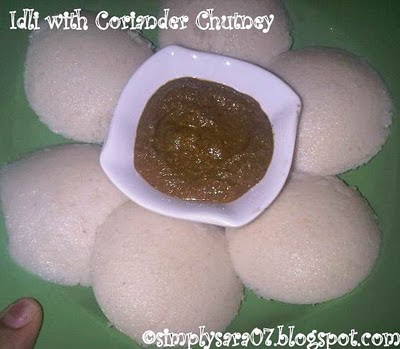 These Idlis are soft, you can also say Mallipoo Idli. Soak all the ingredients except salt for 6-8 hours in water. 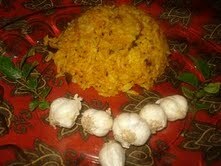 You can also soak rice separately and dals separately. 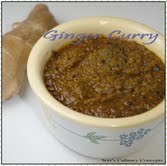 Grind it to coarse or fine paste with water in a mixer/grinder. 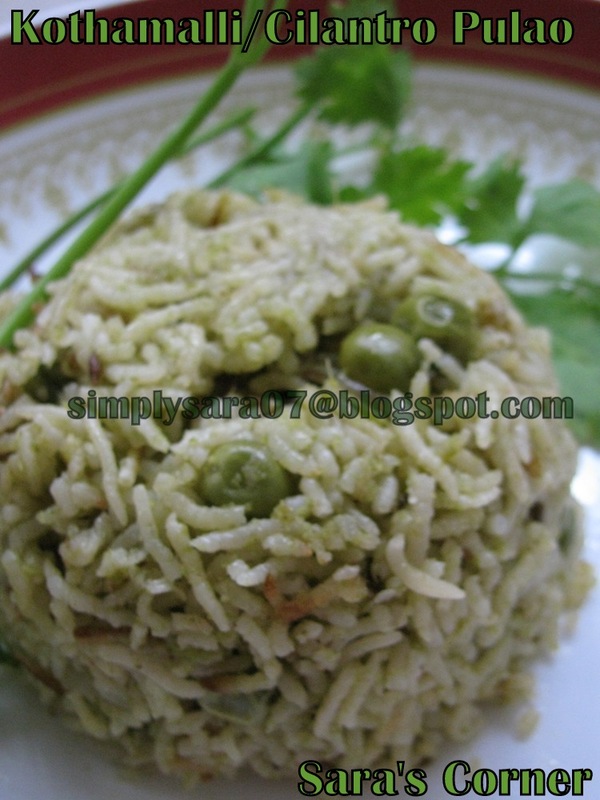 If you soaking separately, grind urad dal first to fine paste and then grind rice. Add salt and mix well by laddle or hand. 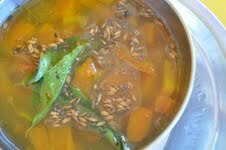 Leave it outside overnite for fermentation. Grease idli plates with நல்ல எண்ணை/ Gingely Oil. Pour the batter and close the lid. Steam it for 12-15 mins. Check with a spoon or fork. If it comes out clean. Off the stove. Allow it to cool a bit and then remove from the plates. 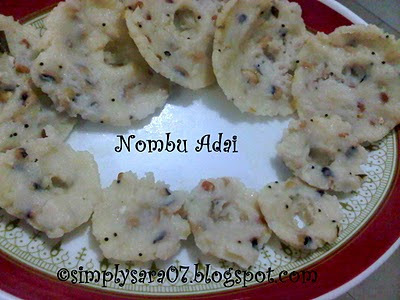 Delicious Soft Idlis are ready to Serve. 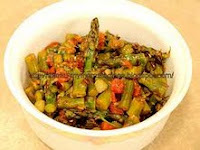 Enjoy it with Sambar or Chutney. 1. You can keep only required amount of batter outside for fermentation and balance in fridge. Can use the same batter for Dosas too. 2. You can also use the ratio 4:1. 3. 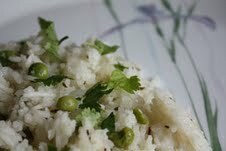 Idli rice - it is available in all indian stores and mustafa. 4. 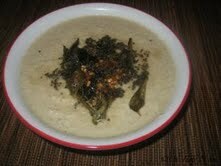 For Dosa and idli fermentation is vimportant. 5. 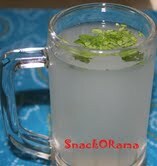 I have grinded in Mixie, so add ice water so mixie is not hot. Takeover of Top 9 from Foodbuzz for a cause of Ovarian Cancer Research by Kelly. Foodbuzz will donate $50 to the Ovarian Cancer Research Fund for the tea party recipe. For more information visit Kelly's space to help the cause. I am baking often since my parents are here and for my son. Eggless Banana Muffins were perfect and enjoyed it. You can also serve for the Tea Party as some like sweets at tea time. In a bowl, add butter and sugar mix well. Mash banana and mix it. Now slowly milk and mix well. Add slowly in parts APF, baking soda and baking powder. Mix it with a hand mixer or beater. Grease the muffin trays, pour to the half of the cup or 3/4th cups. I poured for 1/2 cups since my son wanted small muffins. Mine came upto 10muffins. Bake it for 30mins or check with a fork or toothpick until it comes out clean or bake it for 5 mins more. Cool it. Garnish with cherry. 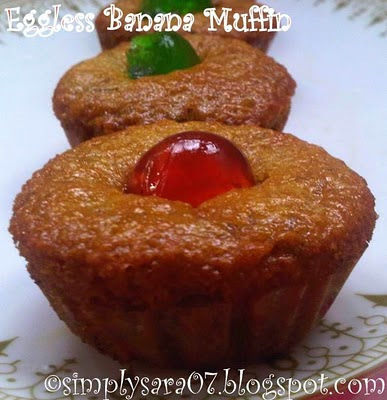 Enjoy Eggless Banana Muffins at Tea/Coffee time or for parties. Notes - You can also add nuts or walnuts. 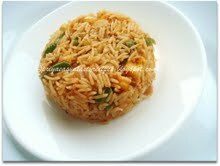 I usually make Capsicum Rice often as its liked by my family members. Its my favourite Variety Rice too. This time I have tried a different one which is simple and easy. Checkout my Capsicum Bath and Capsicum Corn Rice previously posted. 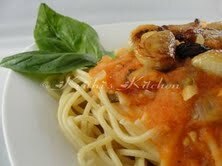 Sending this recipe to Create n Carve guest hosted by Helen and started by Nayna. Chop all ingredients and keep aside. 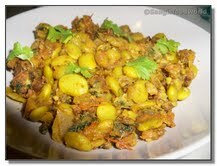 In a kadai, add a drop of oil and roast channa dal, dhaniya and dry red chilli till brown. Cool it and make fine powder. In the same kadai, add oil, channa dal wait till its brown, dry red chilli, onion, ginger garlic, curry leaves, a pinch of salt and saute till transparant. 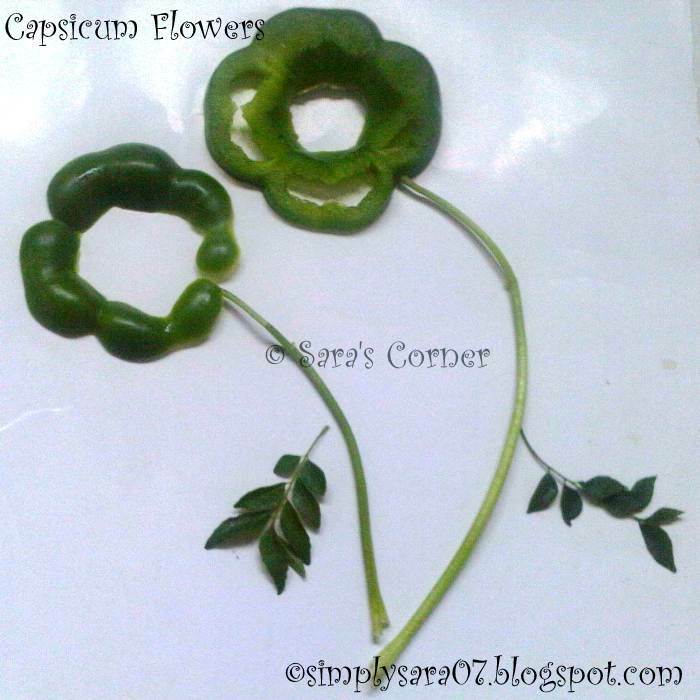 Add capsicum and cook till soft. Add the masala powder and mix well. 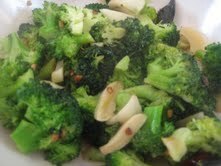 Saute for 2mins. Off the stove. Add steamed rice and salt. Mix well. 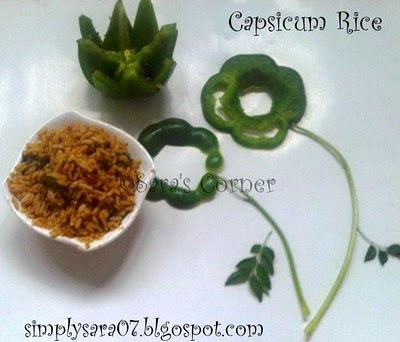 Enjoy hot Capsicum Rice with Papad/Vadams. Eggless Chocolate Cake has won Best Cake Recipe!!! 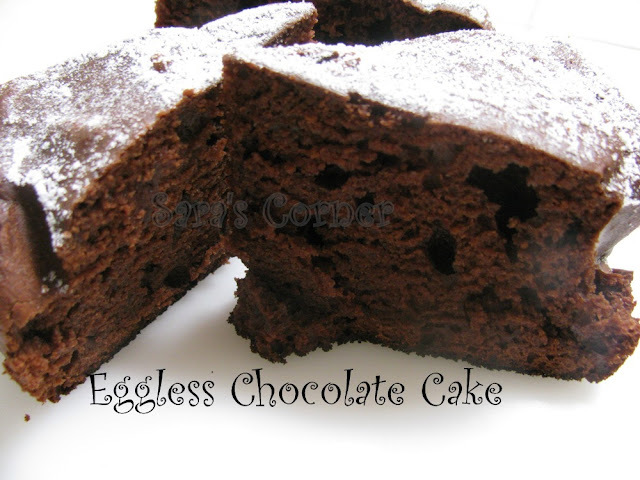 Eggless Chocolate Cake is one more cake in my baking section. 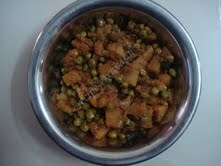 I would like to thank my hubby's cousin Pushpa Akka for helping me with this recipe. After baking this cake I am more confident in baking. In a wide bowl, mix all the wet ingredients in a beater or hand mixer. 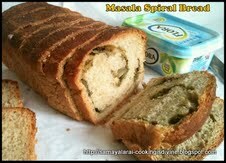 Grease it or spread butter paper in 7 or 8 inch round baking dish. Pour the batter. Bake it for 30mins. Check with a fork when it comes clean or bake it for 5 to 10 mins more. Cool it and slice. I have just dusted icing sugar on top. Enjoy the Eggless Chocolate Cake. 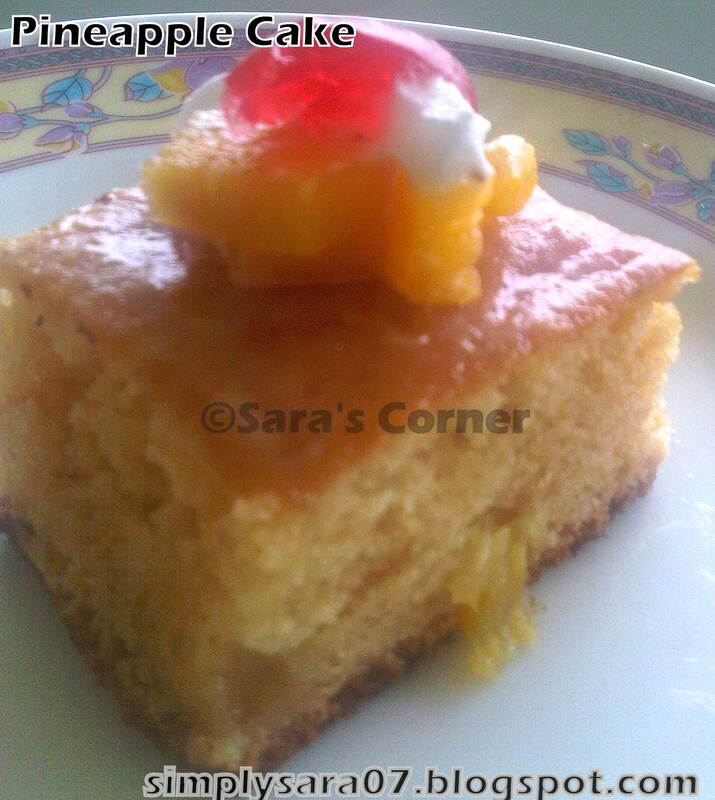 This recipe is going to Crazy for Cakes by Priya. I am excited and happy for my 300th Post. I would like to thank all my friends in blogosphere. Also my first post in this blog was on 10th March 2007 its been 4years in this blogging world. 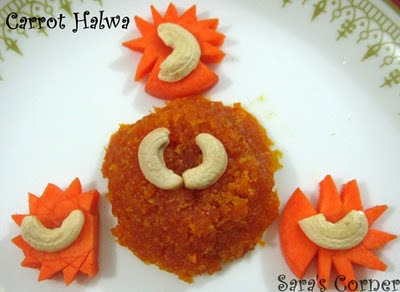 Carrot Halwa is always my favourite in the sweet list. 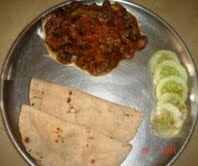 This time I prepared when hubby left out of country. I have used unsweetned Kova in this. I had previously posted a different method of Carrot Halwa here and also microwave Low Fat Carrot Halwa. 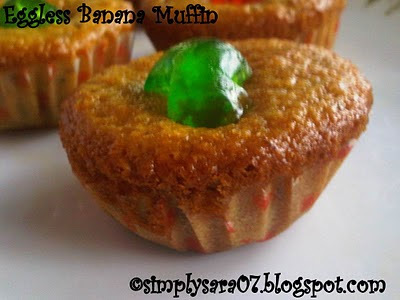 My blog has a wide range of sweets check it out here. In a heavy bottom pan/kadai, add 1 tspn ghee and saute carrots. Cook them. Once its almost cook, you will know by its colour, add sugar and keep stirring, until it becomes thick in low flame. Add Kova and mix well. Add 2 tspns ghee and stir, until its dry. 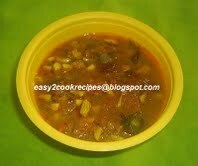 Delicious Carrot Halwa is ready to serve. Serve as it is or with Vanilla Icecream. I am reposting this again, since today is the Nombu Festival. I am going off to prepare. 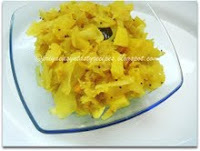 Happy Karadaiyan Nombu to all ladies. Karadaiyan Nombu is on 14th March between 8.00 and 9.30pm. It is a festival celebrated by Hindu married women. The story behind this is Savitri observed fast(upavasam) for the sake of well being and long life of her husband Satyavan. It is continued and believed by tying a yellow thread tied with flowers keeping turmeric at the center in front of Goddess photos. The thread is tied during the time Panguni Masam starts temple priest is best person to get exact time. Prayers are done by Hindu married women offering pooja, vella adai & kara adai, breaking coconut, offering fruits along with betel leaves, betel nuts and turmeric. After pooja is done, they eat kara adai and sweet adai in plantain leaf with edge. 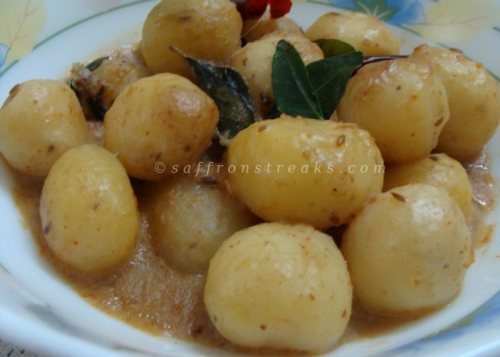 Cook karamani(brown or white) in pressure cooker for about 3 whistles and keep aside. 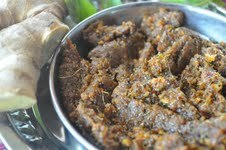 In a thick bottom kadai, season it with oil, mustard, wait till it spulters. 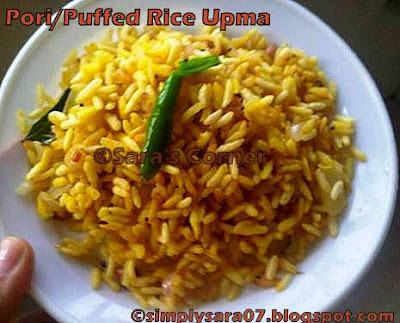 Add Bengal gram, urad dal, asafetida wait till it turns brown. 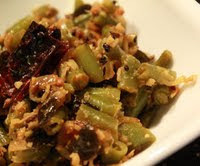 Add curry leaves and dry red chillies and sauté for few mins. Add 4 to 5 cups of water. Allow it to boil. Now add the cooked karamani and salt. Stir for few mins. 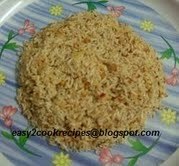 Add rice flour and keep stirring till it absorbs all water in medium-low heat. 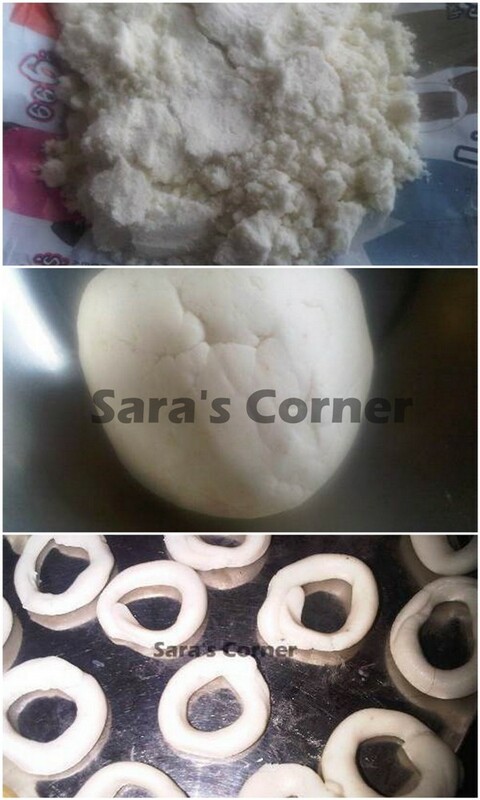 Off the stove and mix well like chapathi dough by hand. 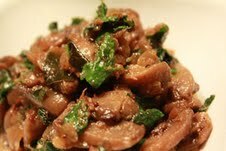 Take a plantain leaf or plastic sheet and grease oil on it. Make small balls, spread by hand to small round patties and make a hole in the center. 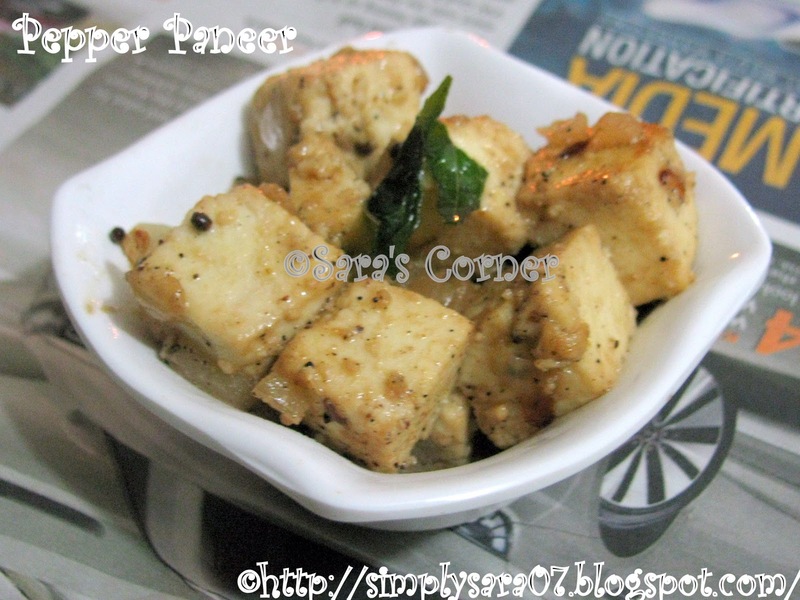 Steam the patties in idli cooker or pressure cooker(without whistle) for 20mins. 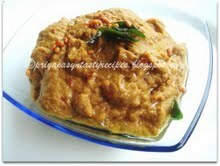 Karaadai is ready to serve with butter. 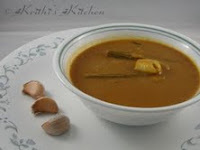 In a thick bottom kadai, put jaggery and water. Wait till it dissolves and filter it to remove mud particles. Now add the cooked karamani. Stir for few mins. Add grated coconut and cardamom powder mix well. Add rice flour and keep stirring till it absorbs all water. Vella Adai is ready to serve. 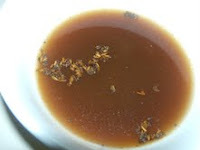 Note - The quantity of jaggery can be reduced or increased according to one's requirement. 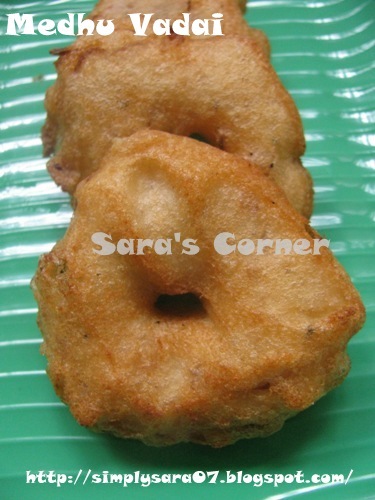 MEDHU VADAI IS A DEEP FRIED SNACK. 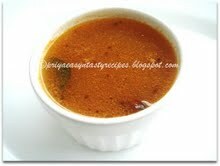 POPULARLY KNOWN WITH COMBINATION OF VADAI SAMBAR IN SOUTH INDIA AS BREAKFAST OR TIFFIN WITH IDLI OR DOSAS. 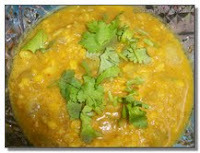 SOAK URAD DAL FOR 3 to 4 HRS. 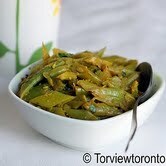 GRIND LIKE THICK BATTER WITHOUT ADDING MUCH WATER WITH GINGER, Green chilli AND SALT. KEEP PAN WITH OIL IN OVEN TO DEEP FRY. IN A BOWL KEEP WATER DIP YOUR HAND AND TAKE BATTER. ONCE THE OIL IS HOT TAKE LEMON SIZE PORTION OF BATTER AND MAKE A WHOLE AND DROP IN OIL. 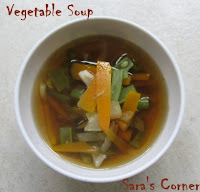 SERVE HOT WITH SAMBAR OR CHUTNEY. YOU CAN SOAK IN CURDS/YOGURT AND HAVE THAYIR VADAI. 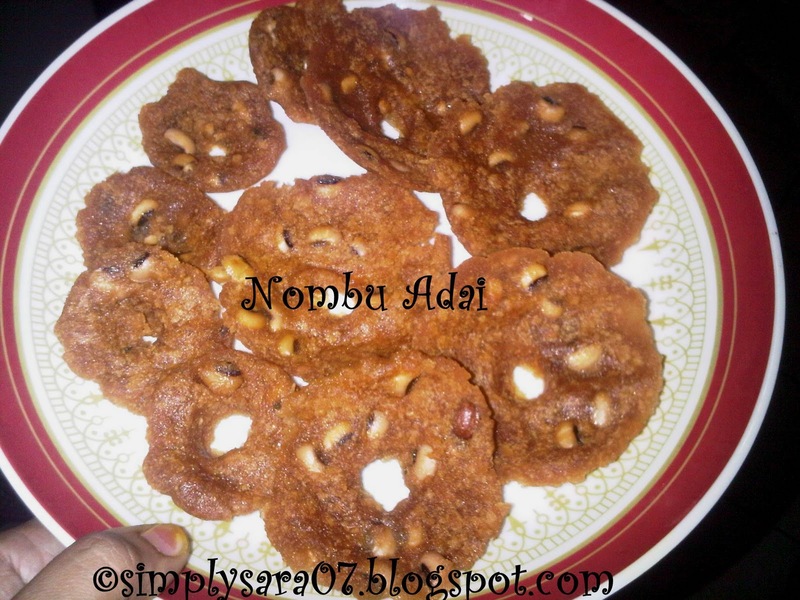 NOTES - YOU CAN ALSO ADD LITTLE RICE FLOUR OR A PINCH OF SODA TO THE BATTER. 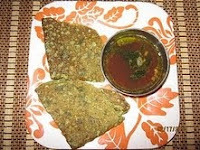 If you are grinding in mixie do not prepare vadas immediately after grinding. Allow for 1 to 2 hrs and then prepare it. 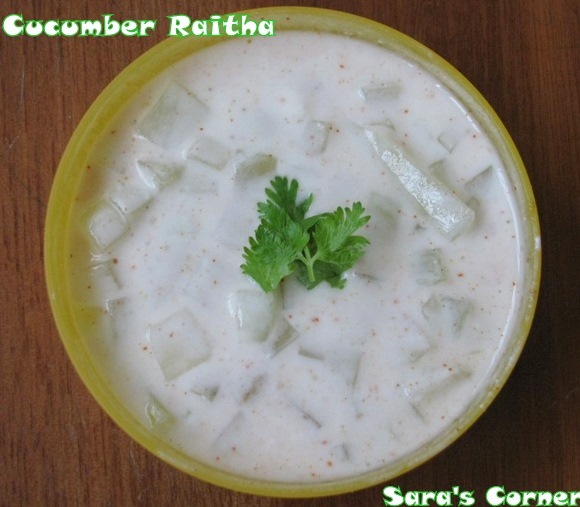 Onion Chutney is a delicious combination for Idlis and Dosas. This is simple but tasty. I got this recipe from my friend here. She makes such delicious chutneys. Heat a kadai with oil, add onion, tomato, ginger, garlic and salt. Saute till onion is transperant. 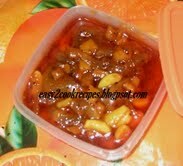 In a blender or mixie grind it to coarse paste with cashews. 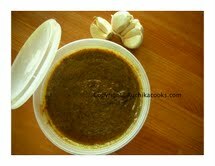 Delicious Onion Chutney is ready to serve. 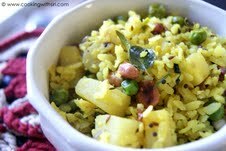 Serve with Dosas or Idlis. I am so excited and happy that I got another opportunity with CSN stores. This time I am doing a review, checkout this new lightings at Pendant Lighting which are so beautiful. It gives me immense pleasure to announce the winners of Healing Foods Ginger Garlic Event guest hosted here started by Siri. Thanks Siri. If you have missed the roundup check it out here. Winners were chosen by random.org out of 31 participants. 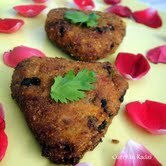 Valentine Vegetable Hearts by Kalva, you will win Cooking At Home With Pedatha and Healthy Bulgar Wheat Upma by Swetha Reddy, you will win Sukham Ayu from Pritya Books. Congratulations!!! You will be contacted by email. 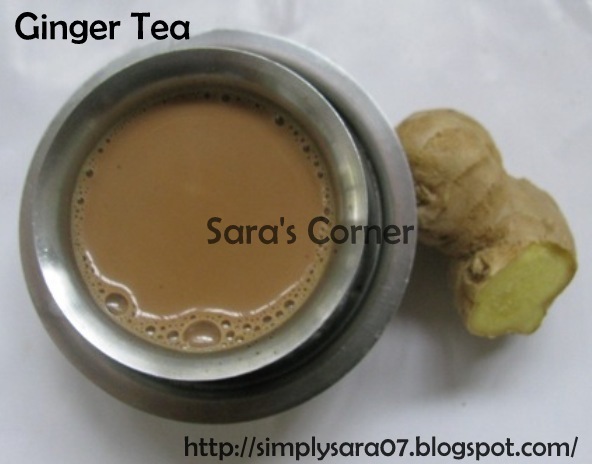 Its 3 am, I am herewith posting the roundup of Healing Foods Ginger Garlic Event. I would like to thank Siri for giving an opportunity to guest host her event. I received 54 entries. Thank you for the support and participation. Do leave a comment or mail me to know incase I have missed any of your entry, which is not intentional. Will update it. ﻿Since I am running out of time as my parents are here with me, will pick up the winner on Sunday. So Keep watching this space. I once again thank all the participants for your entries.